What: Rosemerry Wahtola Trommer poetry readingWhen: 6:30 p.m., Wednesday, Nov. 9 Where: Maria’s Bookshop, 960 Main Ave.
Rosemerry Wahtola Trommer is the author of 13 books and a poetry teacher at myriad organizations. 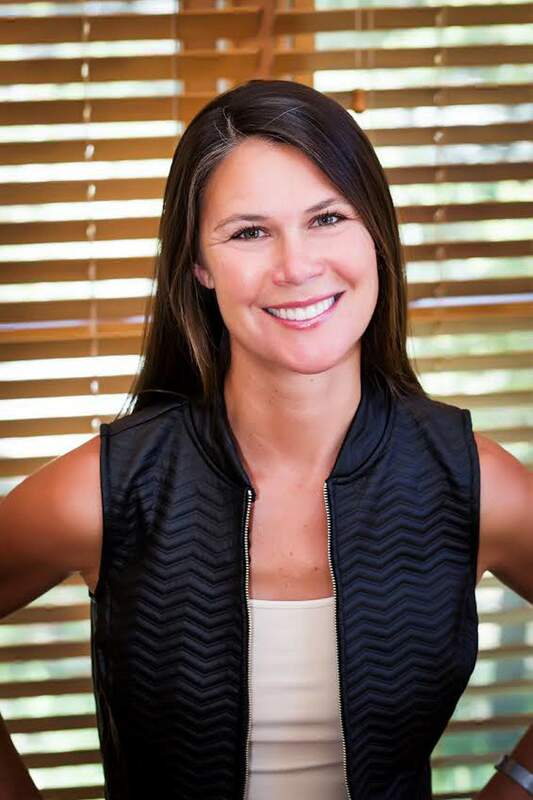 She currently teaches in Telluride at the Ah Haa School, and starting in November will be doing classes at the Wilkinson Public Library. Colorado’s Western Slope Poet Laureate (2015-17), her work has appeared on “A Prairie Home Companion,” in O Magazine and on rocks she leaves around Telluride. Trommer’s most recent book, “Even Now,” pairs her poetry with three-line drawings by artist Jill Sabella. She’ll be appearing at Maria’s Bookshop on Wednesday, Nov. 9, for a reading. We spoke to Trommer about why she writes and posts a poem online every single day and how to make poetry more accessible. Tell me about “Heard of Poets,” the interactive poetry map of Western Colorado you curate. In May 2015, I was named the Western Slope poet laureate, and that doesn’t come with any money or responsibility – just an opportunity and invitation to consider how you could serve the poets in our region. I thought, wouldn’t it be cool to create a map where you could see the poets in your neighborhood? I collaborated on the project with the San Juan Independent, an online newspaper. I find the poets and they run the site. Now we have 40 or 50 poets on there, represented from all over the Western Slope. Can you talk about some of the themes you’ve been inspired to write about since living in the San Juan Mountain region? I moved here in 1994, and my second book “If You Listen” was a collaborative book I did with a photographer named Eileen Benjamin. It was all about the San Juan Mountains. It’s hard to live here and not look out the door and feel humbled and elevated at the same time. That paradox of feeling so small, and so much a part of everything. And a photographer in Durango named Claude Steelman and I came out with a book called “Intimate Landscape,” a collection of photographs and poems of the Four Corners region. The premise of that book is that we’re drawn to these expansive landscapes. We live in grandeur. But the book focused on the small things to fall in love with about the mountains; instead of the field, just one flower. Instead of the entire herd, just one elk. Instead of this enormous mountain range, just this one waterfall. Finding the small beauties. 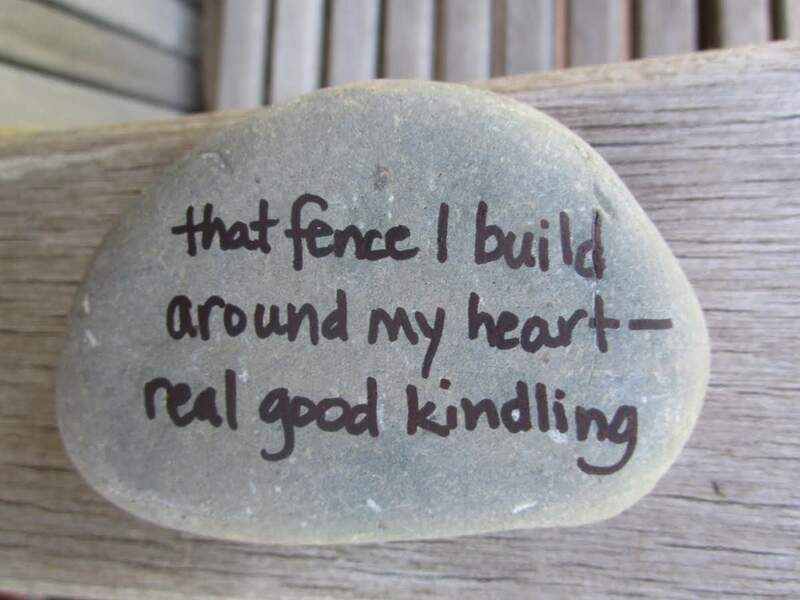 And you also write poetry on rocks and leave them around town?Yes! It helps to have very short poems for that, I only do three lines. I’ve left hundreds of little rock poems all over Telluride. Sometimes I’ll take them with me when I go on the road and leave them on fence posts and curbs and benches and in public bathrooms. Anywhere that looks like a little poem might belong. It’s no secret that a lot of people are intimidated or put off by poetry, and I think that’s unfortunate. Most people, if they have the opportunity to engage with a poem on their own terms, really do enjoy it. They think, ‘Oh, that’s a poem? I like that!’ That’s part of the pleasure in collaborating with other artists; you can pull someone in because of an image, then if they stay in that doorway long enough, they’ll read the poem. Many people need a doorway, they won’t walk to poetry themselves. 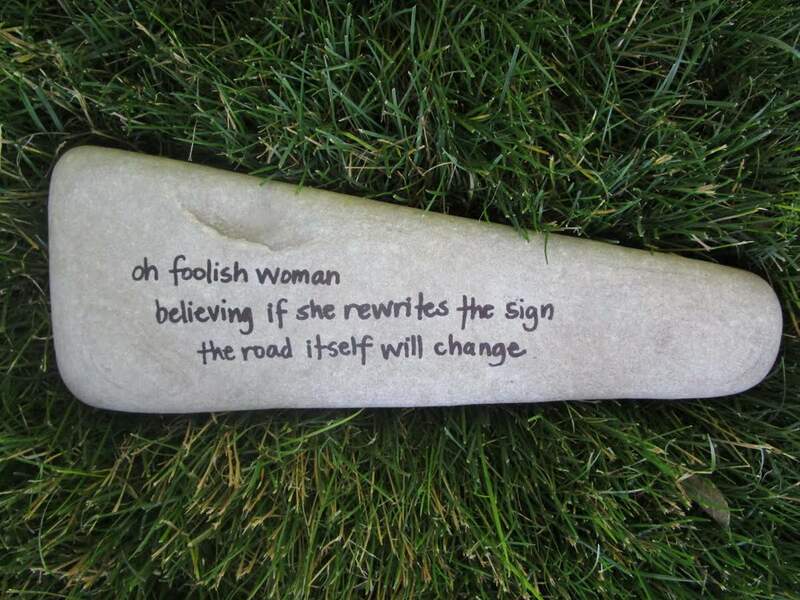 I like to find ways to make poetry show up, like with rocks, that’s non-confrontational. So many people have experiences in school where they read a poem and feel stupid, they don’t get it, they’re supposed to analyze it, maybe they’re wrong ... But the truth with poetry is that when we read a good poem, it finds this resonance in us. It makes us think, ‘Yes, I know that feeling!’ A chord is played and we vibrate with the thrill of recognition. You’ve taught poetry in 12-step recovery programs and hospice. How does poetry benefit those people?The work I’ve done is with people who have lost someone, not for the people in hospice themselves. They’re looking for tools to help with their grief. One thing that poetry asks of us is to be vulnerable, curious, to pay attention to the world around us and our own emotional state. With grief, even though it can be very painful to write about death and loss, there’s also a beauty and honoring in it. And the ability to work through some very difficult things, if you had a difficult relationship with the person. There’s plenty of room for paradox in poetry – in fact, poetry thrives on paradox. So for a poem to have beauty and loss in the same line, or grief and disgust, it thrives on that. You write and post a poem every single day on your blog. Can you talk about that? That began over 10 years ago. I tried writing a poem every day for 30 days, and I remember thinking at the time, ‘Oh, that sounds so hard.’ And at the end of 30 days, I had so much fun, I kept going and I never stopped. It taught me a lot; anytime you do something that much, it becomes not just a practice, but ultimately it can become a devotion. When I sit down to write each day, I promise myself four things. One, that I will write something. Two, that it does not have to be good, but it has to be true. Very few people are interested in cleverness – it’s interesting, but only for so long. What we’re really craving is resonance, somebody to wrestle with the questions we’re all asking, like what does it mean to be alive? When I say it needs to be true, I don’t mean it has to be factual. It can be made up. But I don’t want to write something just to sound good. Who cares? There’s nothing at stake then. Three, I can’t know the ending. If I know the ending, I feel like I’m cheating myself. There’s a gift poetry gives us, of self-discovery. If we know the end, we kind of bypass that, we shut it down. We need to get ourselves out of the way, to meet the poem from this place or uncertainty and curiosity, as opposed to a place of having an agenda. And four, that I will share it.